Hey there, Faviana girls and boys. As we are sure, you probably wash your face daily, after waking up and before going to sleep (if not, you should!). What you probably don’t do, though, is follow our guide to skin cleaning, which is very meticulous buy very easy and fast to complete. As you know, there’s nothing more important than having healthy beauty practices and we always want to make sure that you not only look great but feel great. So keep reading for the best tips on skin cleansing and let us know what you think at the end! Start by using a cleansing oil. Why cleansing oils are. better than any other cleansing cream, milk or soap? Because they help to break down makeup, dirt, and sebum that builds up in your pores throughout the day. Basically, no matter your skin type, cleansing oil uses the “good oils” in your skin to remove the “bad” ones, according to surgeon Dr. Ariel Ostad. It leaves your skin clean, soft and hydrated since oil cleansers have many antioxidant and anti-aging ingredients as well that help to improve the look and texture of your skin. Basically, no matter your skin type, cleansing oil uses the “good oils” in your skin to remove the “bad” ones, according to surgeon Dr. Ariel Ostad. It leaves your skin clean, soft and hydrated since oil cleansers have many antioxidant and anti-aging ingredients as well that help to improve the look and texture of your skin. When you use it just massage it into your skin with gentle circular movements. Instead of a deep exfoliation (you should do it at least once a week before going to bed, so the sun won’t be too harsh on your skin immediately after exfoliating) try using a cream or foam exfoliating that its good but gentle and removes any residue that the cleansing oil didn’t lift. Massage with circular motions as well and either let your face air dry or pat softly with a clean towel. Make sure to pay close attention to the areas of your face where you usually see more clogged pores, such as the sides of your nose or the middle of your forehead. Some people are quick to dismiss the toning process, but it’s actually quite important! Toning your face will remove the last remaining bits of oil, dirt, and debris left by the first steps of the cleaning process. Also, toning helps to nourish and soothe your face, keeping it hydrated and restoring its pH balance (important so your skin won’t produce more oil than it has to). Splash your face with toner a few times, making sure that the mist hits your face, but don’t spray too close to your skin either. You can take a small bottle of toner with you on the go as a skin refresher on warm summer days and as a final step to set your makeup. We love our serum, but you can decide to try or skip this step according to what you think your face needs. Basically, you apply serum just before moisturizing to deliver specific ingredients directly to the areas of your face that need it the most. It’s very concentrated, and that’s why most serum bottles are so tiny. It’s great if you are looking to target a spot on your face that’s giving you problems: redness, dryness, oiliness, wrinkles, acne… options abound! Put three to five drops on your fingertips and pat into the areas that need it most, could be around your eyes and brow bone. Most serums are water-based, but if you get an oil-based one and your skin tends to be oily try diluting it a little bit with toner. Make sure your face gets all the nourishing and soothing that it needs with proper moisture. Bye, dryness! Use the five dots rule: one in your forehead, one in your nose, one in your chin, and one for each cheek. Then gently press it into your skin, making sure it really goes in. Remember how important sunscreen is! Never, ever forget to apply another layer of sunscreen after your moisturizer sets in. Some moisturizers creams come with SFP protection, but we find that it’s even better to add a thin layer of extra protection just in case. 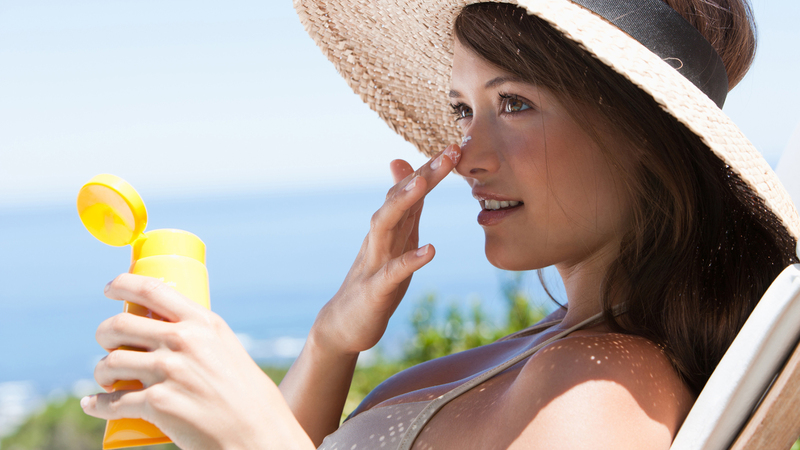 If you need our ultimate guide to sunscreen, here it is. Other than that, do you have other advice when it comes skin cleansing? What are some of your favorite products? Let us know what you think by tagging us on Instagram @glamandgowns, and Faviana’s Instagram @Faviana_NY and Twitter @FavianaNY.